Once upon a time I met Tyler in my apartment complex/ward, and fell madly... ok that isn't how it happened. I was dating someone else at the time, and hoped he would hook up with my roommate. Long story short... he kept coming over to try to be around when I got out of the relationship with the other guy. It worked... but I was worried I'd be breaking roommate/best friend dating rules. Jessica, however, had lost interest in him and was all for me hooking up with him. We started dating in October and made the decision together to be married... it was March 28? Anyway, it was just between us and we went ring shopping and decided to have the ring custom made, which they said would take 2 weeks. I went home and told my parents the good news and then told the rest of the family. Word leaked out of course, and then when the ring wasn't done after 2 weeks we were pretty annoyed because we wanted to have the ring before we shared the news with everyone. Tyler wanted to surprise me with when he was going to formally propose, so after choosing the ring I was out of the loop. Well he went in to the ring store a few days after it was supposed to be done and they said it would be done "by Tuesday" at the latest. that was last Friday. So when Tyler didn't hear from them Saturday or Monday, he figured he'd just do it Tuesday. He got work off Tuesday to put his plan into action. We went shopping for a Tux that afternoon and then he took me up to my harp lesson. While I was in my lesson Tyler went down to get the ring. 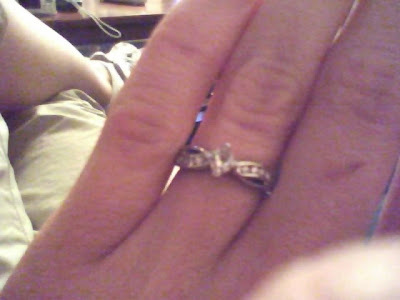 When he got there though... they hadn't even mounted the center diamond in the ring yet. Needless to say, he was really annoyed. It was a week late and still not done. Our salesman was understanding and said he'd have the goldsmith mount the diamond and it would be done in 2 hours.... only in 2 hours when Tyler went back they had mounted the diamond incorrectly. This was only a few minutes before Tyler was planning to take me out to dinner, so he was really frustrated that it still wasn't done. The salesman called all their goldsmiths and had one come in after hours to remount the diamond. Meanwhile, Tyler took me out to dinner at Ruby Tuesdays since that is where we went out to dinner for the first time. He took me there for my birthday in December and it was an awesome dinner. I was trying not to get my hopes up but I kinda thought that he would take me to Ruby Tuesday's when he was getting ready to propose, so the fact that he was texting (the salesman) all through dinner only made me that much more curious. In his defense, however, he was very sweet and romantic while he wasn't texting. I really enjoyed dinner despite the frequent texting, and i completely forgave him once he explained why he had to text during dinner. :) Anyway, we were having such a good time and enjoying each other's company so much that we forgot our leftovers on the table and left... oops. Next Tyler took a detour on our drive back to my place and we ended up at the Logan Temple. We got out and started walking around. It was beautiful! It was sunset and it was as though he'd planned it that way. Turns out he was mostly just burning time waiting for the ring to be delivered to his apt! He tried to keep me guessing though, so as we sat there enjoying the sunset, he said something along the lines of "wow, this is beautiful. This is really romantic huh? too bad i don't have the ring, this would have been perfect!!" At this point I was a little confused because he didn't seem to be lying about not having the ring, but his actions all pointed to him proposing. But he wasn't trying to throw me off last minute; we got up and left a few minutes later. When we got back to my apt, he said he needed to run up to his place for a minute (to get the ring the salesman had just dropped off) so I waited down in my apt. When he got here he said "Hey, I brought my DVD player in case we wanted to watch something. Will you hook it up while I use the Bathroom?" (I don't have a working DVD player) hmmmm.... ok... that's weird. Well I decided not to ruin his fun by acting suspicious so I hooked it up and started cleaning up the coffee table and couch. As I was taking something to my room he came walking out of the bathroom with a rose. He didn't know I was right outside the bathroom and tried to hide the rose but I'd already seen it. I kept playing along because I didn't know exactly what he had up his sleeve (even though I had my guesses from his suspicious questions he'd asked over the previous week or two), and I wanted to let him surprise me after all the work he'd put into it. When I turned it on, pictures of us were playing on a menu. I pressed play and our song, "My Best Friend" by Tim McGraw, started playing. He'd put together a slide show of pictures of us starting from the beginning before we were dating and ending with a picture of the Draper Temple behind the words, "The Beginning of Eternity, June 12th 2009". At this point I was a little teary eyed because it was really a neat slide show. Then the words "Bre, I love you. Will you..." scrolled up the screen. I turned to look at him and he just starred into my eyes. I kissed him and then he kept kissing me while he was trying to get the ring out of his pocket. Haha it was really funny! I knew he was trying to get it out but I kept playing dumb because I could tell he was trying to be so sly about it. Finally he gave up and pulled away to get it out and said "well guess what." at this point he slid off the couch onto his knee. then he said "you already know I love you, Will you be my wife?" And he opened the humongous wooden box the jewelery store had given him the ring in... no wonder he couldn't get it out of his pocked!! I was so excited and without thinking I said "OF COURSE I WILL!" He slid the ring on and then it was official... finally!!! YAY! so that is the story. Now I'm just kinda bummed because it is being re-sized right now. It was a half a size too big. I miss it. But it should be done tomorrow and then I don't have to worry about it falling off! :) well, there you have it! I hope you enjoyed the story. I know it's really long but some people wanted some parts, and other people wanted other parts... so here's the WHOLE thing! PLUS it's not like you're gonna take it off your finger long enough to photograph it in it's box anyways. :) *Sigh* I'm so happy for you! And happy he's cute! And happy you're happy! So, when's the big day? Congratulations (again). ok ok you caught me... we reenacted it for the camera haha.